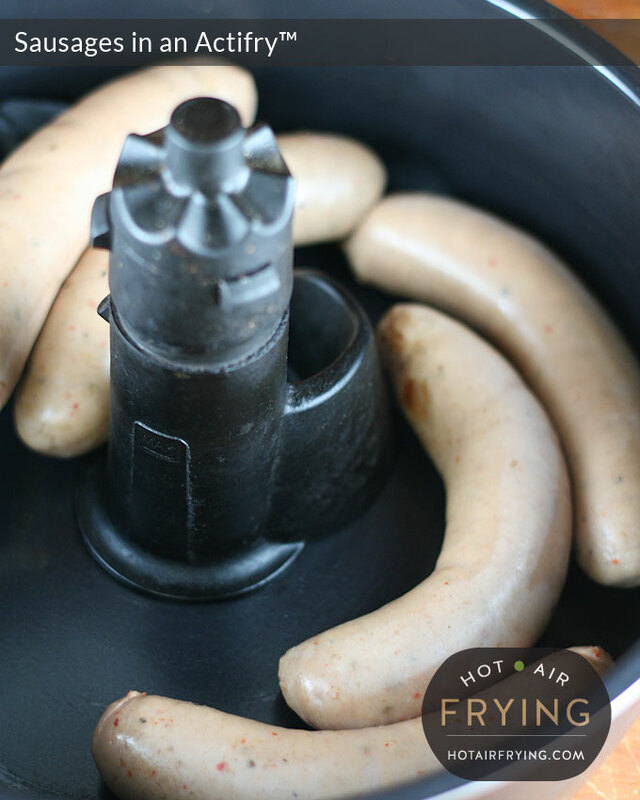 Just toss sausages as they are (thawed) into the Actifry pan, with the paddle left in, for 10 to 15 to 20 minutes depending on the size of the sausage and how browned you want them. No oil or cooking fat is needed in the pan; just cook the sausages as is on their own. 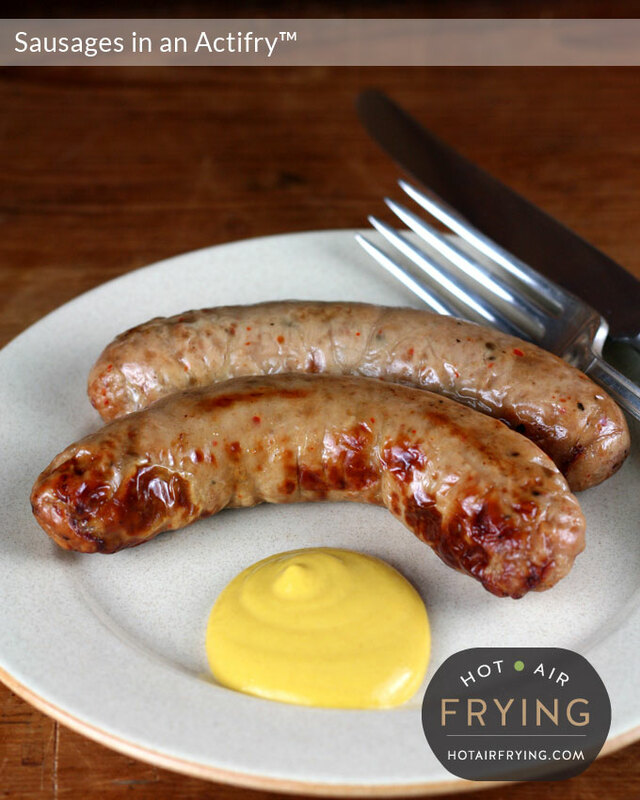 In a basket-type air fryer, put sausage(s) in basket. Cook at about 180 C (350 F) for 7 minutes; toss. Cook for another 5 to 7 minutes until done. (An instant-read meat thermometer helps ensure that you don’t dry them out through too cautious overcooking.) To be clear, you do not need to toss them in oil or spray them with cooking spray. Now, for the discussion and the visual backup for my experiment with this. 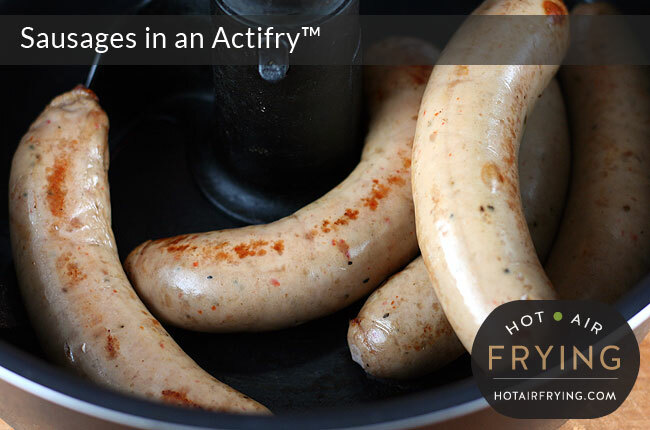 I had seen a few random remarks tossed out in product reviews by several old fellows that sausages were great cooked in an Actifry™. Now, I’ve cooked sausages in the top grill pan of an Actifry 2 in 1, and knew they were good cooked that way — far moister and juicier for some reason than oven-baking them — but I knew that these guys were talking about an Actifry classic model, and that they were just tossing the sausages into the pan, paddle and all, and letting ‘er rip. I happened to pick up some turkey sausages at a ridiculously low sale price — 3 bucks (about £1.50 / €2.00) for 5 sausages. It was a 500 g pack, with 5 sausages in the pack, which made for 100 g (3.5 oz) per sausage. So they were about the size of medium-sized Brats, or good-sized bangers. About 15 cm (6 inches) long. Anyway, while all cooks hate any wasting food for any reason, I figured I would finally do my sausage experiment with these because (a), they were cheap enough that if it was a disaster, oh well; and (b) these were pretty lean so it really would be a test of how well the Actifry could do. At just 110 calories / 3.5 g of fat / 3 Weight Watchers PointsPlus™ per 100 g sausage, they looked so lean that I actually strongly debated tossing a tablespoon of oil in the pan with them, or at least cheat a bit with some cooking spray on them. But, I decided, nope. I was just going to cook them “au naturel” to see how they did on their own with no help. 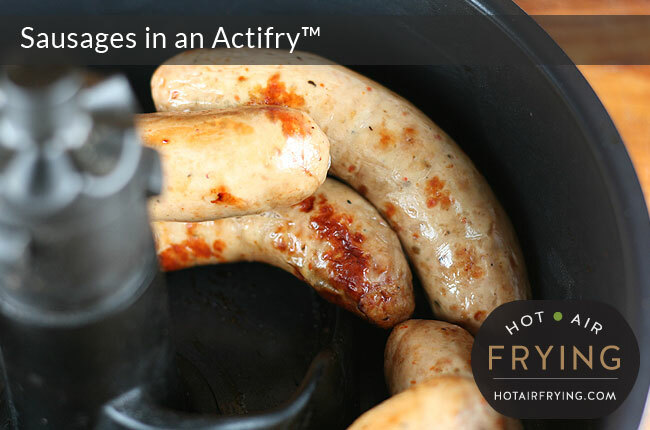 Acid test here of sausages in an Actifry. So I just placed them in the pan, with the paddle in, but with nothing else added. I gave them an initial cooking time of 7 minutes. Sausages after 7 minutes of cooking. That’s fine; I didn’t expect them to be done after 7 minutes. I just wanted to be able to see early on in the game how they were going to progress; I still partly expected the paddle to break them up or something. I gave them an additional 5 minutes of cooking. Sausages after 12 minutes of cooking. After 12 minutes of cooking, a bit more browning, with an internal temperature of 65 C. Close to the recommended safe temperature of 71 C, but not quite there yet. So I gave them another 3 minutes, which would make for a total of 15 minutes. Sausages after 15 minutes of cooking. After 15 minutes of cooking, the internal temperature had hit 74 C, so therefore considered done according to the package which wanted a minimum of 71 C, and I was starting to hear a little bit of sizzling. Mind you, I wasn’t expecting much sizzling. These were pretty lean sausages; there wasn’t gonna magically be a lot of fat to be sizzling out. But still, I wouldn’t have minded a bit more browning, visually, to make them more interesting looking. They were still looking pretty pale. So I went for broke, and give them another 5 minutes to make 20 minutes in total. Ater a total of 20 minutes of cooking, they’re there: I’m happy. There are a few small splits in skins here and there, lots of browning, lots of sizzling noise, and I can actually smell sausage. Yep, much better. Internal temperature of 80 C (176 F) so nice and piping hot without going overboard to dry or toughen them. Now, turkey sausages are lean. There is no two ways about that. You definitely want to enjoy these with some mustard, sauerkraut or a batch of baked beans on the side, or with pasta. But, I’ve had very lean turkey sausages baked in an oven before, and these hot air fried ones came out moister — not dried out at all. What little “juice” they have in them, they retained, it didn’t dry away. 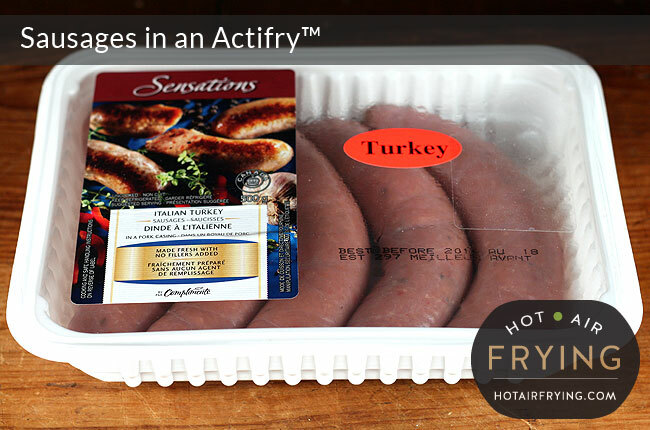 The other advantage is that you do not need to turn the sausages, the machine does that for you, so you can just set the time on the machine and get on with making the rest of your meal; the Actifry will entirely look after the sausages for you. 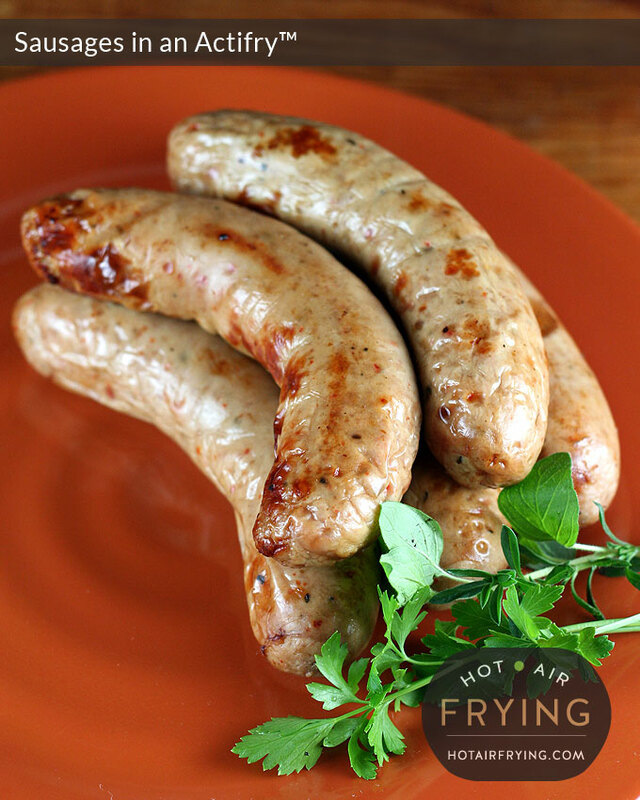 So the verdict is: yep, those old geezers in product reviews saying they just tossed the banger sausages for their spot of tea into their Actifry were bang on and knew what they were talking about. I use an Instant Read Meat Thermometer, to help ensure I cook meat safe without overcooking it. They are so cheap now there’s no reason to live without one, and you can get ’em with nice big easy-read dials these days, like the Oxo Good Grips One. When buying, be aware that some models come in metric, some are US and some are dual. Make sure you are getting the one you want, and with a large face: no need to squint anymore like you had to previously with the dime-sized ones. I cooked my beef sausage the way that you recommended above and they turned out great,except for the amount of fat which was leftover. 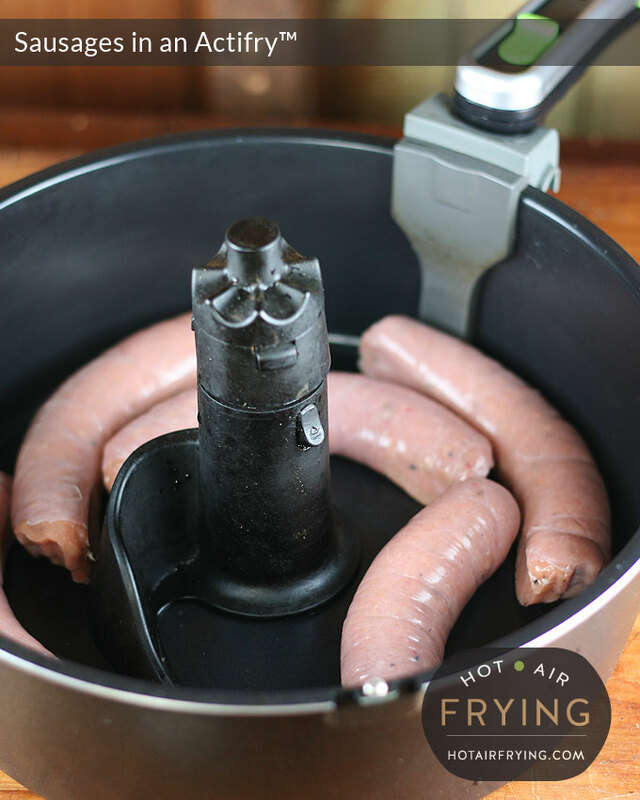 When cooking sausages again, I think that I will boil them for a few minutes (after piercing them) and then put them in the Actifry. I liked the way that the meat browned up, but the amount of grease was untenable. 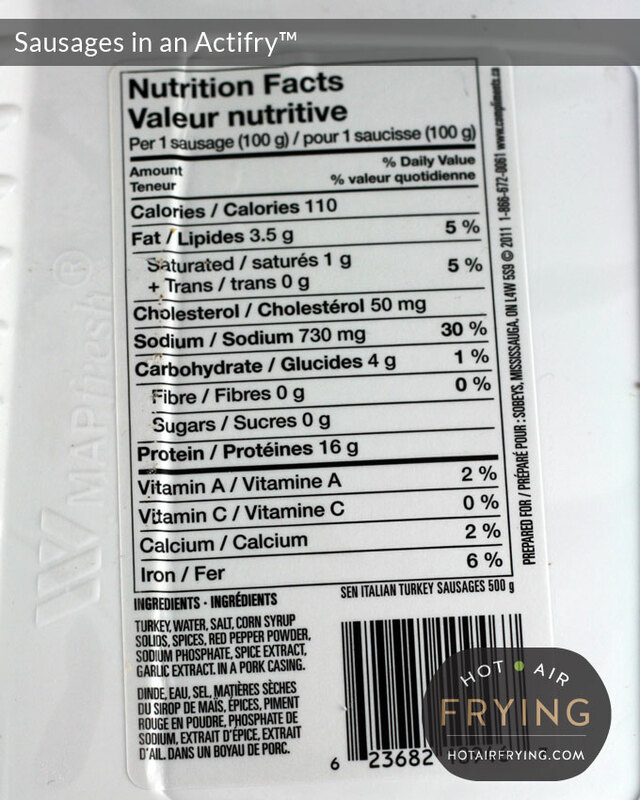 I would recommend the following for sausages made in Alberta, Canada. Pierce the sausages every inch or so,boil them for about 5 minutes and then cook them in the Actifry for about 15 minutes for 5 sausages. I’m wondering about cleanup: are all the ActiFry parts dishwasher safe? I guess I’m really tempted to buy one since ordinary frying, beside all its other faults, smells up the kitchen. All the removable parts are indeed dishwasher safe, you better believe it: I’m the kind of person where everything goes in the dishwasher! Good thing I am going grocery shopping today! Adding sausages to my list! 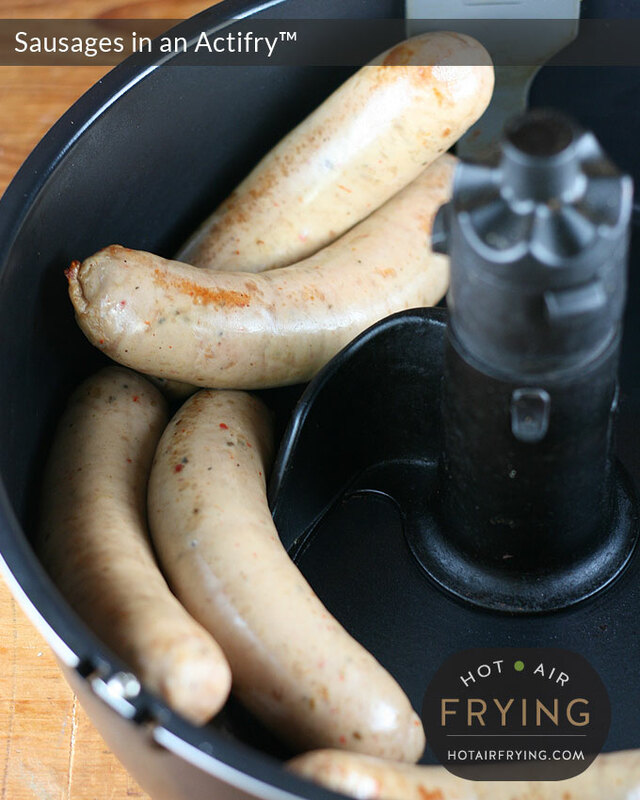 I LOVE my Actifry but would never have thought of doing sausages in it! I tried those little McCain’s Potato Pancakes and they got really messed up. Crunchy and delish, but sure didn’t look like potato pancakes anymore! More like mushed up Tater Tots! Going to have bangers and mash for supper!! Yes, sausages are great in it! So far I’ve found the ones I’ve done in the Actifry to be better than pan fried or oven baked ones, I’m not sure what it is that just makes them turn out better. LOL. Yes I tried those McCain’s Potato Pancakes in the Actifry too, as well as waffle fries. I was pretty sure they were going to end up as one big mooshed mess and yes, sure enough they did! I also have a Philips basket-type air fryer that doesn’t have a paddle so I use that now for those types of things. Cheers and thanks for stopping by! Let me know how your sausages turn out. I cooked smoked brats in the basket of my air fryer. They turned out delicious. Will definitely cook them again.